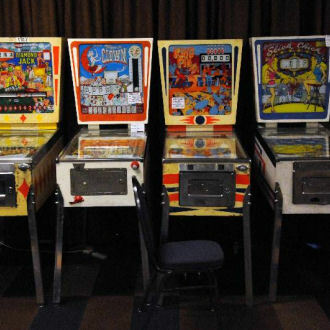 It's a weekend-long classic arcade and pinball party, with all of the games set to free play! May 4-5, 2019, in Mesa, Arizona. To stay abreast of the latest ZapCon news, join our mailing list! This year's schedule is now LIVE! You can find it in the (surprise!) SCHEDULE tab. Admission and shirts are also available in their respective homes above. See you in less than three weeks! In the market for a brand new Stern pinball machine? Zapcon, Marco Specialties, and Stern Pinball are teaming up for 2019 to offer show discounted Stern pinball machines for pre-sale! Games will be shipped, unboxed, and setup for free-play in the Marco booth for the duration of the show. This is a great opportunity to get a Stern game with just a few days of play on it. Hurry as this offer is extremely limited! Zapcon will also provide a free weekend pass with each game! Email Rachel at rbess@marcospec.com for more information on pricing and availability. All orders must be in and paid for before April 11th or the games will not be delivered in time. Quantities of some games are extremely limited. Games must be pre-ordered and paid in full on or before April 11th. Games will be setup and set on free play for the entirety of the show. You're responsible for breaking down, packing up and transporting the game after the show ends on Sunday at 6:00 pm. All sales are final. No upgrades/downgrades. Credit cards will incur an additional fee. Paying by check or money order is best. Join us this Friday at Cobra Arcade Bar for Zapcon Night! Drink specials and free tokens if you wear your Zapcon shirt or badge! There'll also be a Random Fighters tournament hosted by This Old Arcade. Free to enter with trophies and prizes on the line! This Saturday Kick off Zapcon Night season with us at StarFighters Arcade! 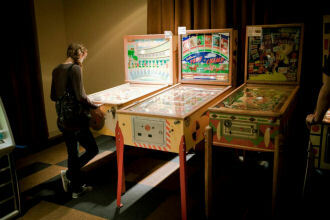 The event starts with an IFPA pinball tournament, doors at 1:30, start time is 2pm. It will be 8 rounds of group match play. $11 to enter, but FREE if you wear your Zapcon shirt or badge! Afterwards join us for the normal Starfighters Saturday hours, also FREE if you wear your Zapcon shirt or badge! The dust is settling on another successful Zapcon and we'd like to thank everyone who came and shared the joy of classic gaming with us for the weekend. ESPECIALLY everyone who went through all the trouble to bring games. We know it ain't easy, and we are incredibly humbled that you chose be a part of our little event. Passes will be continue to be available at the door. T-shirts will also be available while supplies last! There seems to be a bit of confusion, so to set the record straight, ZAPCON 6 PRE-REGISTRATION IS STILL AVAILABLE! :D The only difference is now you are limited to a nameless badge and black unisex shirts. Head over to the SHIRTS/ADMISSIONS page and get yours today! TODAY will be your last chance to order a personalized badge or shirts that aren't black and unisex. We have to place our order with the printers. Starting tomorrow you'll only be able to preorder blank badges and black unisex shirts. Head over to the SHIRTS/ADMISSIONS page and grab them while you still can! Zapcon 6 badges and shirts are now on sale! go to the SHIRTS or ADMISSION page to purchase. As always, the personalized badges get you into the show early, as well as perks throughout the year at Zapcon Nights. Additionally, this year we're offering color shirts that are only available via presale. There will only be black shirts for sale at the show, so be sure to get yours now! March 23rd is the final Zapcon Night before the actual Zapcon! There'll be an IFPA Match Play pinball tournament starting at 7pm, which is FREE if you wear your Zapcon shirt or badge! Even if you're not into competitive pinball, come hang out with your fellow gaming enthusiasts at The Grid and have a pint! Join us tonight at Bonus Round for Zapcon Night! There'll be a Killer Queen tournament with pint-trophies on the line! Show up with your Zapcon shirt or badge and get some food and drink specials! Some of the fondest memories from my childhood were when I or one of my friends could talk a parent into dropping us off at the nearest arcade for a few hours. We'd do our best to stretch $5 worth of tokens as far as possible. Sometimes that meant playing a game that wasn't that great, but you were really good at. Sometimes it meant spending your in between game time taking long, slow strolls up and down the aisles soaking in the lights and sounds, watching the attract modes of games you were curious about, or watching other people play in hopes of picking up a new killer technique or of seeing a level or mode you haven't been able to get to. Sometimes it meant spending a ridiculous amount of time waiting in line to play the arcade's hot new game. All of it was pure bliss, and none of it exists today as it did back then. The modern arcade has shifted focus to redemption games (ticket spitters), as they can no longer compete with the home console market. All but one of the old guard pinball manufacturers have disappeared. There are precious few places to play the classics and even fewer where one can get the "classic arcade" experience. That is why we have created Zapcon. We want to relive the joy of going to the arcade, and to share that joy with younger generations who couldn't experience it first hand. We want to give collectors and restorationists a chance to show off their wares and to buy, sell, or trade with other like minded enthusiasts. Most of all we want Zapcon to become an annual event that will promote and preserve classic arcade and pinball culture for years to come. See more photos here and here and here and here and here! Social media! It's great, apparently!